Olimar is certainly an interesting amiibo to train – he breaks many of the fundamental rules of amiibo training. 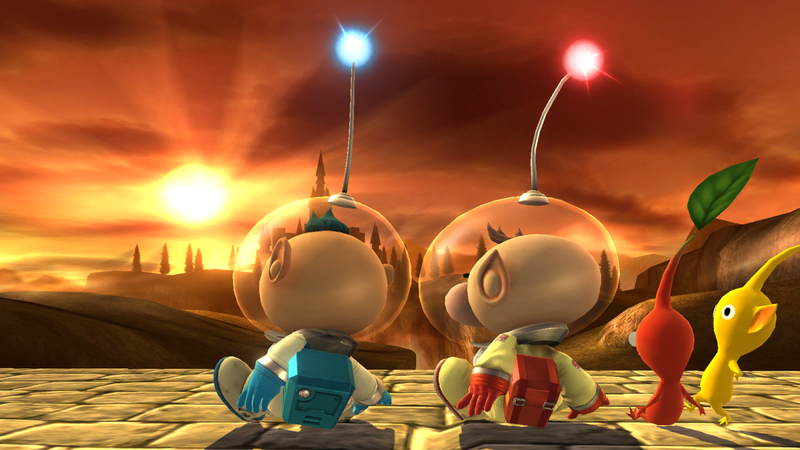 Unlike other characters, who actively try to KO their opponents with powerful attacks, Olimar prefers to stand around and wait. A well-trained Olimar can control the pace of the game by “intimidating” his opponent into standing completely still. At times, Olimar’s passive nature will freeze matches for minutes on end, meaning that he usually only wins through timeouts where he has the stock and percent lead. Olimar’s primary damage-racking move is his Pikmin Throw, which works effectively as a campable projectile depending on what Pikmin Olimar is using. His melee options are limited, but he has good tilts and a decent jab. But overall, Olimar nails passiveness – sadly, that’s really all he has going for him. Olimar’s biggest problems come from his AI. Being passive isn’t necessarily a bad thing, but Olimar’s AI seems incapable of properly responding to direct attacks. Instead of consistently blocking, dodging, and countering active opponents, Olimar tries to use his grab, which is too slow to be effective. It’s also very difficult to teach Olimar’s amiibo to KO opponents, as he rarely ever uses his tilts or smash attacks. Furthermore, he sometimes forgets to pluck Pikmin when he runs out. If Olimar doesn’t have any Pikmin, he will only use his tilts and jab, but it may take him a few seconds to call his replacements. Finally, Olimar’s light weight means that he’ll be easily tossed around by heavy hitters such as Ganondorf and Bowser. 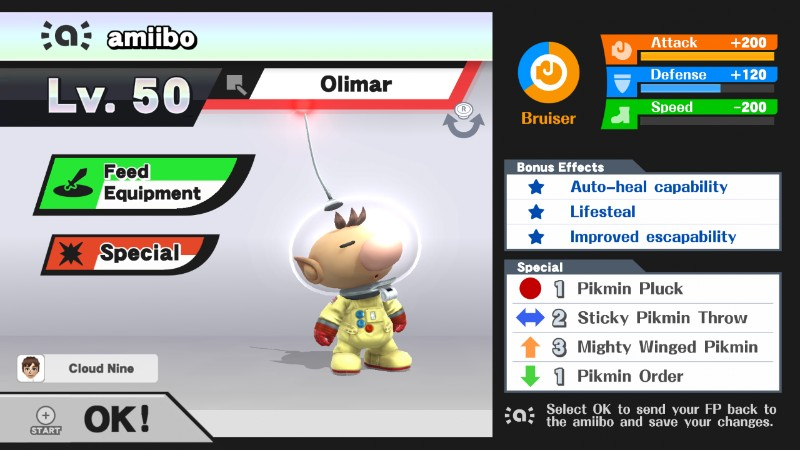 Olimar is a bit of a pain to deal with at times, but if you’re patient enough to train him, he can become a master of winning timeout games with his passive playstyle. If you’re hoping for a character who actively seeks to KO his opponents with well-timed attacks, though, you should look elsewhere. Sticky Pikmin Throw: This is a custom side special that increases the amount of time that thrown Pikmin will latch onto their opponents. This makes Lifesteal even more useful. Mighty Winged Pikmin: If you use the default move, Olimar will throw all of his Pikmin off-stage to their deaths in an attempt to increase his recovery. Mighty Winged Pikmin removes this problem and helps Olimar return to the stage without issue. Neutral options: jab, forward tilt, down tilt, and Sticky Pikmin Throw. Your go-to move with Olimar should be Sticky Pikmin Throw. It racks up damage quickly, and heals Olimar for additional health when paired with Lifesteal. If your amiibo approaches you at low percent, use jab, forward tilt, and down tilt. If your amiibo is far away, camp with Sticky Pikmin Throw. Main KO moves: forward smash and up smash. Olimar is often hesitant to use his smash attacks. He’ll often have his opponent at upwards of 300%, but will fail to seal the deal with a KO. It’s important to teach Olimar to KO with his forward smash and up smash attacks. Moves to avoid: grab and down special. Olimar’s grab is horrendously slow, and he tends to overuse it rather than rely on his superior jabs and tilts. Pikmin Order is generally useless, as Olimar’s Pikmin will either be right next to him or latched onto an opponent. There’s no need to call them back. Situational moves: Pikmin Pluck. Olimar tends to forget to pluck his Pikmin after losing them. 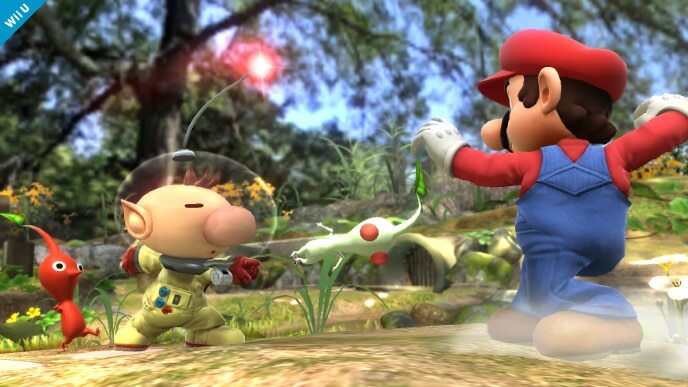 If you lose a Pikmin during training, pluck a new one immediately. Thanks to Blue for compiling Olimar’s information. Images are courtesy of SmashWiki and the official Super Smash Bros. website.